« Carpe diem » might well be the Latin sub-title of the M114 collection with its blend of character and refinement. A line distinguished first and foremost by its sophisticated contemporary design, but also a worthy heir to almost 160 years of watchmaking history. 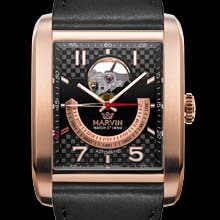 The rectangular case – available in PVD pink gold-plated or steel versions – features beautifully curved polished and satin-finished lugs ensuring a perfect fit on the wrist. The black or silver-coloured dial has an open heart at 12 o’clock offering a plunging view into the heart of the self-winding Sellita SW 200 movement with its 38-hour power reserve. A carbon fibre pattern on the dial adds a dynamic modern touch to these watches. Like all Marvin wristbands, this virile strap is extremely supple on the wrist and reveals a cheerful red lining, the casual reverse side of a model intended for those who take advantage of every minute while deliberately keeping things simple. New time, new codes. Made in the finest watch workshops, the M114 collection is driven by a Sellita SW200 Swiss made selfwinding movement. It is water-resistant to 50 metres and covered by a two-year warranty.